"Kids can be the most ruthless people in the world. They can be supernaturally cruel." 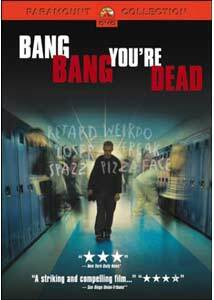 There are two extended sequences in the Showtime original movie Bang Bang You're Dead that searingly capture the devastation, fear, indignity, and horror of school bullying. The first is an amateur video shot by the film's protagonist, Trevor Adams (Ben Foster), in which he captures brutal acts of student abuse in school hallways and bathrooms, while expressing frustration, anger, and despair at his own victimization. The second excerpts several powerful moments from an actual play entitled Bang Bang You're Dead, in which a convicted school shooter confronts his dead victims in prison. According to the closing credits, the play has been downloaded more than 100,000 times since its 1999 premiere, and performed in "thousands" of community venues all over the world. The rest of Guy Ferland's film is typical TV movie drivel, but those two scenes make Bang Bang You're Dead an invaluable document for parents and adolescents alike, as it shines a glimmer of light on the psychological agony that can drive a troubled, vulnerable teen to take violent revenge on both his abusive peers and the society that supports them. For contemporary families, this is must-see-DVD�a film to watch together, analyze, and discuss. On the outside, Rivervale High seems like a typical suburban school, filled with a largely white, middle-class population. New student Jenny Dahlquist (Jane McGregor) quickly discovers the divisive cliques that polarize the campus when she tries to find a seat in the cafeteria. Cheerleaders, jocks, druggies, preppies, skateboarders, nerds�they've all staked their territory in the lunchroom, and don't tolerate outsiders. At an empty table sits Trevor, the ultimate loner/outcast. Dubbed "The Mad Bomber," Trevor targeted the football team with an unwired explosive device the previous year, after enduring continual abuse and humiliation at the hands of the school's swaggering athletes. As a result, Rivervale now resembles a maximum security prison, complete with metal detectors, guards, and a zero tolerance policy. Jenny doesn't shun Trevor like the rest of the student body, and the two strike up a delicate friendship. In addition, drama teacher Val Duncan (Tom Cavanagh of TV's Ed) hopes to help Trevor by allowing him to vent his frustrations in the controversial play Bang Bang You're Dead, which the school's nervous parents staunchly oppose. Life looks brighter for Trevor, yet Rivervale's extremist group, a collection of bullied kids known as The Trogs (short for troglodytes), counterbalances such positive influences. The Trogs admire Trevor for standing up to his assailants and taking serious action, and they court him to join their clique. Craving acceptance, Trevor enters into their culture of guns, warfare, and paranoia. Soon he produces a disturbing, violent tape for Mr. Duncan's video production class, reigniting suspicions concerning his motives and mental state. As tensions escalate between the jocks and Trogs, Trevor is drawn into the battle, and must decide whether to participate in the deadly rampage his desperate friends are plotting. William Mastrosimone's script effectively drops in references to Columbine and Paducah to add topical relevance, but often errs by oversimplifying and stereotyping characters and environments to fit its agenda�the overbearing father, subservient mother, one-dimensional jocks, sensitive nerds. He also peppers his screenplay with too many platitudes that sound like they were borrowed from self-help pamphlets. Lines like "When you label a kid at risk, you just created a kid at risk," and "It's not what's in a kid's backpack that makes him dangerous; it's what's in his heart" are prime examples. Yet ultimately, it's easy to forgive all the faults, because the movie's basic statement is so vital and affecting. Somehow, someway, the film preaches, this vicious cycle of violence must end, and maybe if it's addressed forcefully and realistically, we might have a shot at defeating it. Although Mastrosimone's screenplay lays out the message, it's up to the actors to deliver it. Mediocre performances predominate with one notable exception. Ben Foster is flat-out brilliant as the tortured Trevor, hammering home the film's points with a natural intensity that makes him utterly, consistently believable. His eyes alone transmit so many conflicting, painful emotions, while his detached vocal tones and introverted body language complete his masterful portrait of a teen in crisis. Without him, Bang Bang You're Dead might maintain its power, but it would lose its devastating punch. Image Transfer Review: Paramount presents Bang Bang You're Dead in its original full-screen format, and the image adopts an appropriately gritty look. The source material, however, is spotless, and the clarity, even during the numerous grainy, jerky video cut-ins, remains excellent throughout. Blacks are especially solid and rich, and Trevor's dingy basement bedroom possesses a high degree of detail. Although director Ferland adopts a rather washed-out palette, moments of lush color often emerge, and fleshtones are always accurate. Another high quality transfer from Paramount. Audio Transfer Review: The stereo soundtrack offers full, penetrating audio with no distortion. Gunfire possesses appropriate oomph and the contemporary music enjoys good fidelity. Trevor's haunting voiceover during his video sequence is especially effective, but dialogue is clear and comprehendible at all times. Extras Review: The subject matter demands a few extras to help parents and teens sort through the potent issues, but sadly, Paramount remains true to form and keeps this disc skeletal. Ben Foster's memorable performance heightens the impact of Bang Bang You're Dead, as he puts the issue of school violence on a personal, visceral level that makes us realize no one is immune to its far-reaching effects. From a production standpoint, Guy Ferland's film rarely rises above the mundane, but the points it addresses and its stark, uncompromising treatment of bullying and the carnage it inspires make it relevant and worthy of attention. Recommended.